■ Hale Motu’apuaka— a 2-time former junior division champion (ages 6-11) in 2008 and 2011, and a 3-time former intermediate champion (ages 12-17) winner from 2014-2016, was awarded first place in this year’s 2018 open division title of the World Fireknife Championship held at the Polynesian Cultural Center. After two nights of preliminary competition, the finale was held on May 12th with the 3 finalists during the intermission of the evening show, Ha: Breath of Life. 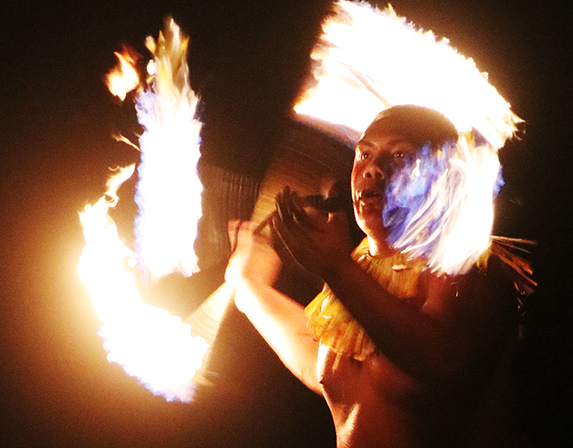 After a blazing display of creative tricks and skills from the finalists, Motu’apuaka scored the highest by the panelists and was crowned the 2018 World Fireknife champion at the end of the show. Along with the title, Motu’apuaka won a $7,500 cash prize, a large, stylized nifo oti deadly tooth] knife, a tuiga [ceremonial headdress] and cultural adornments. Following his graduation from Punahou School in Honolulu at the end of May, Motu’apuaka said he will report to Utah State University in Logan, Utah, where he has accepted a full football scholarship (from among nine offers) to play on the defensive line. “I’m very excited. I leave June 10th.” He added he hopes to study business marketing at USU, and then come back to Hawaii. 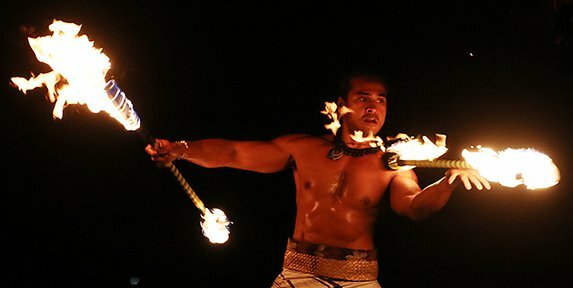 Motu’apuaka also said he first appeared in the Polynesian Cultural Center’s World Fireknife Championships in 2004 when he was only four years old (the minimum age for competitors then-and-now is six). He’s been performing professionally since he was five, and more recently he’s been working various fire knife gigs three-to-five days a week. ■ The judges awarded 2nd place to Matsushima Yuya, 24, from Fukushima Prefecture in Japan, who has been knife dancing professionally back home for the past three years. With the translation help of PCC Asia marketing manager Masa Kunihiro, Yuya said he started to teach himself about 15 years ago. “I first started watching videos to learn, and there are also Hawaiian shows in Japan that I watched. He added he first entered the PCC World Fireknife Championship competition in 2015 but did not place that year. 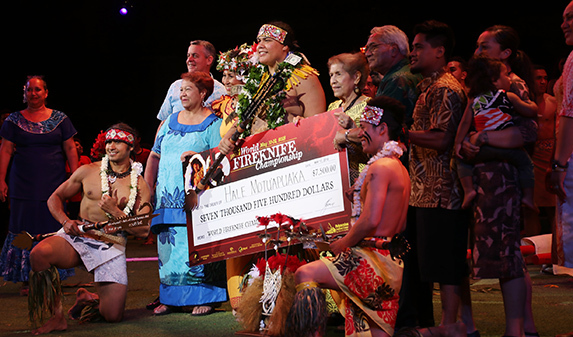 In addition to the title, Yuya won a $5,000 cash prize, a stylized nifo oti knife and a palefuiono — ceremonial crown. ■ Three-time former WFK champion — 2012, 2013 and 2015 — Joseph Cadousteau took 3rd place in the 2018 World Fireknife Championship. For his victory, he also won a $3,000 cash prize, a stylized nifo oti knife and a palefuiono — ceremonial crown. He is originally from Papeete, Tahiti, but performed for the past seven years at Disneyland Hong Kong. This past February he moved to Vancouver, Washington, to be closer to his wife’s family, and hopes to get some gigs in that area. They have two small children and another on the way. However, Cadousteau said he was glad to meet other new competitors this year at the Cultural Center. For example, he said he saw Yuya compete in Japan earlier this year, “and I knew he would be a big surprise in the World Fireknife Championship. He’s very good. I was excited to meet him and see him leading a new generation of fire knife competitors. Judges selected the three 2018 World Fireknife Championship finalists from a field of six semifinalists who competed on May 11 in the Hale Aloha Theater. The other three semifinalists (in no particular order) were Via “VJ” Tiumalu, formerly of Orlando, Florida, who now lives and works on Maui; Kepanipaa Damaso of Waikoloa, island of Hawaii; and Wallen Te’o of Honolulu. 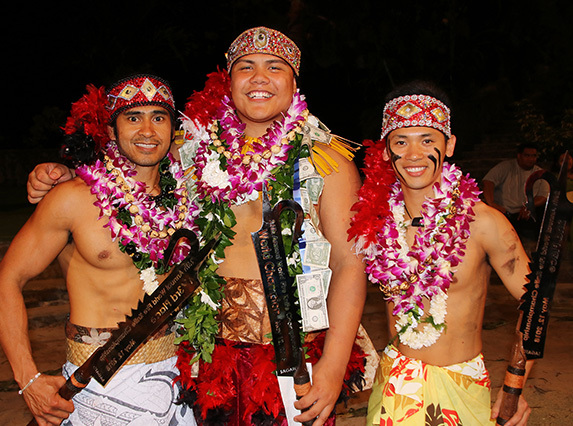 The Polynesian Cultural Center gave each of them a $500 honorarium. 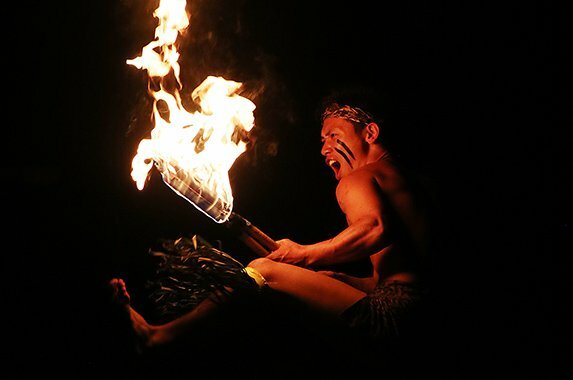 The Polynesian Cultural Center started the preliminary round of open division competition in the 26th annual World Fireknife Championship on May 10, 2018, in the Hale Aloha Theater with a field of 19. Several others who had previously competed anticipated entering again this year but withdrew due to injuries. The 13 other open division entrants (who did not reach the semifinals or finals rounds) include (in no particular order): Matuni Vaiaoga, now of Orlando, Florida; Alema Alema of Apia, Samoa; Kenshi Jorden from Gifu, Japan; Okuto Horiuchi from Okinawa, Japan; Sato Yujin from Fukushima Prefecture, Japan; Rex Tiumalu of Orlando, Florida; Vaela’a Iloa of Apia, Samoa; Clayton O’Conner and Viceson Galea’i, Laie, Oahu; Heimana Ondicolberry from Papeete, Tahiti; Jako Pupuali’i of Orlando, Florida; Kuinise Leiataua from San Diego, California; and Vincent Evau of Lahaina, Maui. From all of those who attended the events, and the more than 30,000 others who tuned in on live-stream internet each night, FA’AFETAI TELE (thanks very much) and MALO LAVA (congratulations) to all of you for sharing your incredible skill and talent with the world. Want to read more about our 2018 “We are Samoa” and “World Fireknife Competition” events? Click here! Story and photos by Mike Foley, who has been a full-time freelance writer and digital media specialist since 2002. Prior to that, he had a long career in marketing communications, PR, journalism and university education. Foley learned to speak fluent Samoan as a Mormon missionary before moving to Laie in 1967 — and still does. He has traveled extensively over the years throughout Polynesia, other Pacific islands, and Asia. He is mostly retired now but continues to contribute to PCC and various other media. Foley is an original member of the World Fireknife Championship Committee and has covered more than 20 of these competitions.